The home of a family of five is now a crime scene: four of them savagely murdered, one – a sixteen-year-old girl – is missing. Was she lucky to have escaped? Or is her absence evidence of something sinister? Detective D.D. Warren is on the case – but so is survivor-turned-avenger Flora Dane. Seeking different types of justice, they must make sense of the clues left behind by a young woman who, whether as victim or suspect, is silently pleading, Look For Me. "Will keep everyone guessing up to the surprising end. Though the material Gardner writes about might sometimes be dark. . . Look For Me ultimately reveals how love and hope can overcome all." "Suspenseful and wholly believable, this ninth entry will win new fans for the series, especially among those who favor Karin Slaughter's gritty procedurals." "Gardner shines a heartbreaking light on foster care abuse while steadily ratcheting up the tension to a genuinely surprising and emotional finale." "The twists and turns in this gripping D.D. Warren adventure will keep readers turning the pages." "A splendidly dark foray into the blood soaked-reality of family secrets. . . a relentless page-turner chock full of Gardner's trademark twists and turns." "Master storyteller Gardner does an outstanding job delicately building the evolving relationship between these two damaged but strong women. . . As always, the plot is intricate and intense." "Gardner has yet again put together a frightening thriller that offers a web of plots that tie together perfectly in the end." 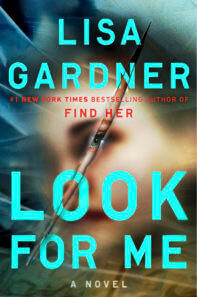 "With Look For Me, Lisa Gardner has added another notch in her belt."